^ 1.0 1.1 Giuseppe Garibaldi (Italian revolutionary). [6 March 2014]. ^ «Come è noto Garibaldi maturò un forte anticlericalismo, per quanto non fosse ateo, ma anzi profondamente religioso e, una volta iniziato alla massoneria, "appassionatamente credente nel suo Ente deistico"» in Garibaldi: cultura e ideali Atti del LXIII congresso di storia del Risorgimento italiano (a cura di Stefania Bonanni). Roma, Istituto per la storia del Risorgimento italiano, 2008, p.511. ^ Baptismal record: "Die 11 d.i (giugno 1766) Dominicus Antonina Filius Angeli Garibaldi q. Dom.ci et Margaritae Filiae q. Antonij Pucchj Coniugum natus die 9 huius et hodie baptizatus fuit a me Curato Levantibus Io. Bapta Pucchio q. Antonij, et Maria uxore Agostini Dassi." (Chiavari, Archive of the Parish Church of S. Giovanni Battista, Baptismal Record, vol. n. 10 (dal 1757 al 1774), p. 174). ^ (often wrongly reported as Raimondi, but Status Animarum and Death Records all report the same name "Raimondo") Baptismal record from the Parish Church of S. Giovanni Battista in Loano: "1776, die vigesima octava Januarij. Ego Sebastianus Rocca praepositus hujus parrochialis Ecclesiae S[anct]i Joannis Baptistae praesentis loci Lodani, baptizavi infantem natam ex Josepho Raimimdi q. Bartholomei, de Cogoleto, incola Lodani, et [Maria] Magdalena Conti conjugibus, cui impositum est nomen Rosa Maria Nicolecta: patrini fuerunt D. Nicolaus Borro q. Benedicti de Petra et Angela Conti Joannis Baptistae de Alessio, incola Lodani." Il trafugamento di Giuseppe Garibaldi dalla pineta di Ravenna a Modigliana ed in Liguria, 1849, di Giovanni Mini, Vicenza 1907 – Stab. Tip. L. Fabris. ^ 5.0 5.1 Kleis, Sascha M. Der Löwe von Caprera [The Lion of Caprera]. Damals（往事（英语：Damals））. 2012, (6): 57–59 （德语）. ^ G. M. Trevelyan, Garibaldi's Defence of the Roman Republic, Longmans, London (1907) p. 227. ^ 8.0 8.1 8.2 8.3 8.4 8.5 8.6 Garibaldi, Giuseppe. Autobiography of Giuseppe Garibaldi. Walter Smith and Innes. 1889: 54–69. ^ 9.0 9.1 Jackson, Kenneth T. The Encyclopedia of New York City. The New York Historical Society and Yale University Press. 1995: 451. ^ Bell, David. Ships, Strikes and Keelmen: Glimpses of North-Eastern Social History, 2001 ISBN 978-1-901237-26-9. ^ Hibbert, Christopher. Garibaldi and His Enemies. New York: Penguin Books, 1987. p. 171. ^ Shepard B. Clough et al., A History of the Western World (1964) p. 948. ^ Mack Smith, pp. 69-70. ^ Mack Smith, p. 70. ^ Carroll, Rory. 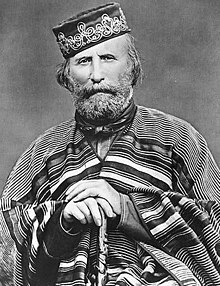 Garibaldi asked by Lincoln to run army. The Guardian (Guardian News and Media Limited). 8 February 2000 [3 June 2008]. ^ Mack Smith, p. 72. ^ Laurenza, Vincenzo. Garibaldi a Malta (PDF). B. Cellini. 1932: 143–161. ^ Diamond, Michael. Victorian Sensation. Anthem Press. 2003: 50–53. ISBN 1-84331-150-X. ^ Visit of Garibaldi to the Britannia Iron Works, 1864. Bedford Borough Council. （原始内容存档于2012-05-25）. 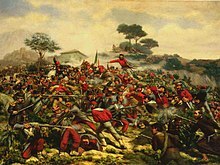 ^ Giuseppe Garibaldi's body to be exhumed in Italy. BBC News（英国广播公司新闻）. 26 July 2012 [2 October 2013]. ^ Alan Johnston. 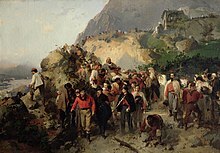 Garibaldi: Is his body still in its tomb?. BBC News. 14 January 2013. ^ Garibaldi, Giuseppe. Autobiography. 1889. ^ Garibaldi, Giuseppe; Alexandre Dumas, père（大仲马）. The Memoirs of Garibaldi. 1861. ^ Sinistra costituzionale, correnti democratiche e società italiana dal 1870 al 1892: atti del XXVII Convegno storico toscano (Livorno, 23-25 settembre 1984). L.S. Olschki. 1988 [21 February 2011]. ISBN 978-88-222-3609-8. ^ Garibaldi – the mason Translated from Giuseppe Garibaldi Massone by the Grand Orient of Italy. ^ Denis Mack Smith (Editor), Garibaldi (Great Lives Observed), Prentice Hall, Englewood Cliffs, N.J. (1969) p. 76. ^ Zane Grey Theatre: "Guns for Garibaldi", February 18, 1960. Internet Movie Data Base（互联网电影数据库）. [19 October 2012]. Hughes-Hallett, Lucy. Heroes: A History of Hero Worship. New York: Alfred A. Knopf. 2004. ISBN 1-4000-4399-9. Morris, Charles. Young People's History of the World for the Past One Hundred Years. 1902. Ridley, Jasper. Garibaldi. New York: Viking Press. 1976. MacCarthy, John. "Garibaldi and the Revolution in Italy", The American Catholic Quarterly Review, Vol. VII, 1882. Mack Smith, Denis. Garibaldi (Great Lives Observed). Englewood Cliffs, N.J.: Prentice Hall. 1969. Werner, A. Autobiography of Giuseppe Garibaldi Vol. I, II, III. New York: Howard Fertig. 1971. G.M. 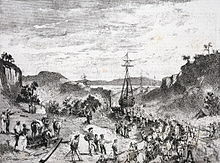 Trevelyan（乔治·麦考利·特里维廉）, Garibaldi's Defence of the Roman Republic and Garibaldi and the Thousand. Garibaldi, Giuseppe; Dumas, Alexandre. Garibaldi: an autobiography. Routledge. 1861. BBC News "Giuseppe Garibaldi's body to be exhumed in Italy"
Garibaldi & the Risorgimento – Brown University. 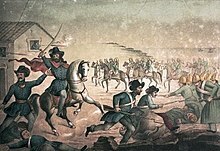 Brown University Library Original water-color panorama 273 ft in long painted around 1860 depicting the life and campaigns of Garibaldi. Review of Lucy Riall（露西·里厄尔（英语：Lucy Riall））'s Garibaldi: The Invention of a Hero. "That bronze of Garibaldi in New York Village … a long story", by Tiziano Thomas Dossena, bridgepugliausa.it, 2012.